Popular Private Client is focused on servicing the bank’s growing high net worth customer base through a personalized private banking experience. The technology-based branch allows customers to “check-in” with a digital concierge to access different service categories: Managing Money, Investing, Borrowing, Service and other reasons for the visit. Popular Community Bank, a subsidiary of Popular Inc., announced Wednesday the expansion of its high tech branches with the opening of the 285 Madison Avenue location in New York City. 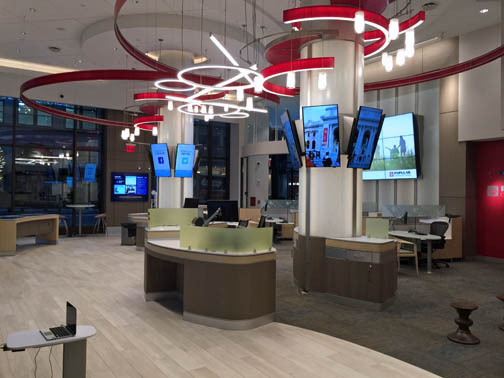 The Madison Avenue branch, between 40th and 41st street, is part of Popular Community Bank’s retail network transformation, a major initiative aimed at enhancing a customers’ experience in the branch, the company said. This branch is driven by technology and a high personal touch delivered by onsite experts. These digital bank branches allow customers to define their methods of interaction and when, where and how they want to conduct their business. “Popular Community Bank is constantly searching for new ways to deliver a positive customer experience. We’ve enhanced our in-branch experience to enable a complete view of the customer journey and ensure that all customer touch points work in an integrated fashion,” said Manuel Chinea, COO of Popular Community Bank. “Our focus is to deliver enhanced customer engagement as well as service their needs effectively and quickly. We have taken into account the behaviors of our customer segments and have built a customer experience around their lifestyles,” he said. The concierge guides the customer on how to best leverage EasyDeposit ATMs, mobile and other in-branch self-service tools to expedite the visit. It also has the ability to address more complex banking needs such as financial planning or lending requests by getting the right product specialist in front of the customer. The first of these branches was introduced at 2121 Avenue U in Sheepshead Bay, Brooklyn, New York City. The transformed branch banking experience is now being implemented across other Popular Community Bank branches. The new technology branches have increased transactions by 24 percent in the last few months. Through 2016, 13 branches are scheduled for conversion as part of the retail network transformation initiative with the goal of transforming the entire branch network in 2017, bank officials said. Hey Buddy!, I found this information for you: "Popular Community Bank expands high tech experience". Here is the website link: https://newsismybusiness.com/popular-community-bank-expands-high-tech-experience/. Thank you.